I’ve been invited by Lara Anderson to participate in the writing process blog tour. Lara is a gorgeous writer whose words always touch something deep within me and make me gasp with their beauty and truth. I’m so grateful our paths have crossed in this writing world, and I’m touched she tapped me to participate next. Although I’ve kept (what I refuse to call) a journal for most of my life, I’ve only recently begun writing regularly, in a deliberate way, with purpose and finished pieces and publications. Until about a year ago, the demands of home and work felt paramount. At first, I felt compelled to submit, submit, submit to every place I could think of, everywhere I saw the work of writers I admire. I was driven by a need for legitimacy and clout as much as my signature impatience—both a great virtue and vice. I was hardwired to seek validation by some objective metric. Eventually, the thrill of exposure waned and in its wake, I was left with a deep love of the process and a handful of really brilliant writers to follow and befriend. What I loved most was the writing itself. Stringing the words together. Creating something that revealed my heart. Connecting with others through words. Most days I feel like a fraud. My legal training was highly formal; surely I can’t wake up one morning and simply declare myself a writer? No, I’m no writer. Often, it seems, I churn out muck. Who are these gracious people showing up, reading my words? Am I allowed to love it this much? Am I allowed to do this? Is this a thing? I’m working on finding out. I always have several draft essays in the works—either for this blog or to submit elsewhere. If a piece is more personal or less linear, I’ll put it here. If I think it could have more mass appeal or fits well with another site’s voice, I’ll pitch it. Lately, I’ve enjoyed publishing more on my own site because I can control the content and timing. I have no schedule for when or how often I post on this blog—I write when I have something to say, and I hit publish when I feel it’s finished. For now, I’m slowly working on an essay that skims the surface of all this—of what I believe to be my story if I ever had one. It feels, in short, like what I’m meant to be working on. Oh goodness, I don’t know. Does it have to? At times I feel insufferably generic, but I truly believe everyone has a story to tell and only they can tell it. And I love that there are kindred writers in my world—their words fill my days. Theirs are the voices in my head pushing me to do better, go deeper. They help me see what’s possible. I write mostly about the small, mundane moments of my day-to-day life as a mother of young sons because this is my now. It’s what I’ve got. But writing about it, I’ve found, helps me not wish it away, not miss the meaning in this messy life. I like to find the story in the ordinary day. I write to find comfort in the commonality of it all—we’re all in our own homes, going about our separate, solitary lives, but maybe, just maybe you’ve felt this way too? You’re out there walking alongside me, even from many miles away? Even if we’ve never met? I try to write authentically about my own ordinary existence and hope it resonates with others. I rarely, if ever, sit down to churn out a full piece start to finish. Rather, I write in the crevices of my day, around the edges of a life filled with little ones and little time. I tap thoughts and triggers into an app on my phone as they come to me (how remarkably unpoetic) and once a theme or coherent idea emerges, I try to string it all together in my early morning hours. 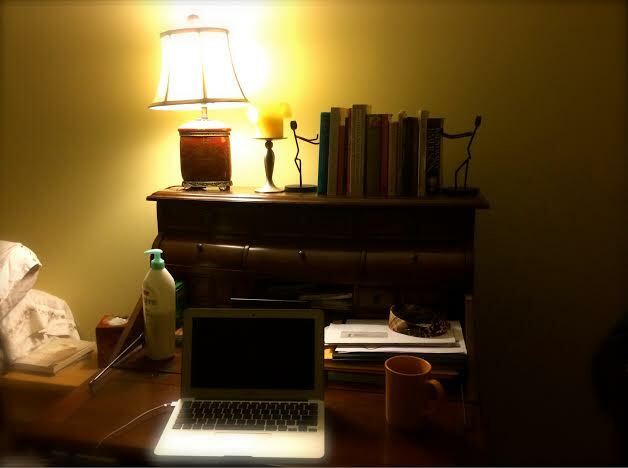 I carve out 4-6am every morning (3am if I’m really inspired) to write before sunrise with my coffee companion (always in the same yellow mug, and piping hot). I love everything about the early morning and starting my day with nothing but my quiet, coffee, words. I’ve tried to write at night; it’s a bad idea. Often one of my boys will have wandered into my bed in the middle of the night. He will breathe deeply beside me as I tap the keys, sometimes stirring. I often wonder if deep in the recesses of their minds, my sons will remember me, their mother, sitting and writing in the dark as day edges out night. When I write, I tend to sit hunched over, shoulders tense, on the floor, in a bed, or in the least ergonomic chair I can find. And I bite the skin on the insides of my fingers—a horrible habit I’m trying to break. I also forget to eat. When I have an idea burning a hole in my pocket, I’m restless until I get a first draft down (thanks again, impatience). Then I let it sit—a sorry unstructured mess of half-thoughts and unfinished sentences. But the polishing and playing with words, the whispering them aloud into the darkness, the writing and rewriting…well, that’s the best part. Even when I think a piece is done, I let it sit for one more day. I leave it alone, while somehow simultaneously taking it with me, walking around with it, letting the words breathe, and giving my mind the space and clarity it needs to return. Then, after I submit or publish a piece, I perform my ritualistic, unproductive post-mortem where I obsess over what I could have written better. And the tour continues…I’d like to ask Kim Simon and Alisa Brownlow to share their writing processes next. Kim was one of the first writers I followed, fell in love with, admired from afar. I love how she masters both humor and heart with sincerity. She’s got snark and sweet to spare. When I click over to one of her pieces, I know I’ll either be laughing hysterically or on the verge of tears. She has an achingly beautiful, relatable way of writing about motherhood (read this or this). She’s also doing admirable work through the I Support You movement to build support and understanding among all parents—formula-feeders, breastfeeders, everyone—no matter how they feed their children. Alisa is a writer I’ve come to “know” more recently, but I’m so glad I found my way to her words. They always resonate, delivering those “me too moments” I crave—like here and here. She authored one of my favorite “About” pages on a blog ever—although it’s on her old site and I hope she doesn’t mind me sharing it here. Also, gotta love another ex-lawyer turned writer mama. So here’s to this writing life…and this blog tour, because while writing may be a solitary pursuit, I couldn’t do it without knowing others are out there toiling away too. This was so special to read especially because we met at our writing group two weeks ago! And I could not understand more or share your insecurity about declaring yourself a writer having been “trained” to do something entirely different. Writing in the crevices of the day, cherishing the messiness, so rich. Gorgeous. I’m a finger skin biter too, which seeing written may be enough to make me stop. You may say that you write about the mundane, but man is your writing anything but that. I’m laughing out loud (while simultaneously chewing on my thumb). When I read your responses to these questions, I was transfixed. So thank you so much…your words here mean more than you know. Thanks so much for reading & commenting. Dina, I eat your words like dark chocolate. Sister, you are a WRITER and an artist with words. My wish list in life includes reading your book – you have so much to say and share and the most beautiful way of doing it. ‘When I have an idea burning a hole in my pocket, I’m restless until I get a first draft down…Then I let it sit—a sorry unstructured mess of half-thoughts and unfinished sentences. But the polishing and playing with words, the whispering them aloud into the darkness, the writing and rewriting…well, that’s the best part.’ This is totally me (except not in the pre-dawn hours! ), and how perfectly you’ve put it. Process has become almost everything to me recently. I was struck, reading ‘Still Writing’, by Shapiro’s observation that the best moment for a writer is not usually the day the work sees the light. It is the day she rounds the corner and the end of it comes into her own purview. How true. All of which is to say, write that book of yours. Look at the comments here, you touch people with your words, because your essence (which is more other-regarding than most) shines through them. Love that you can relate–I recall seeing a lot of my own process in your answers. And those last few lines of this comment? I’m tucking them away, and will carry them with me always. Thank you, friend. Dina, Keep writing that book you’ll never write on your relationship with religion and love, faith and philosophy. I for one would be very interested in reading it. Thank you so much for mentioning me here, I’m touched that you’ve stopped to read my (highly occasional) work. Always love reading you. Dina- I finally got a chance to sit and really read your words and oh my, I relate to SO much of this. You are a beautiful writer, with a very wise outlook. As a trained lawyer, I think I need the “evidence” to prove to myself that I can call myself a writer. Like I need a box to check first. A lawyer’s path is so precise, and this writing one, is so messy and meandering. But I love writing just the way you do, and I love how you put it all together. Very honored you tapped me and looking forward to finding out my own answers. So well put, Alisa. ‘Evidence’…exactly. Like there’s an unyielding need for proof, or to drop a citation, to substantiate even our non-legal lives. Thank you so much for these words–and for being willing to be up next. I’m looking forward to reading about your process! Like every word you write, this is so beautiful. You inspire me. You sound so much more like a writer here than any lawyer I’ve ever known. And like Lindsey says, please, please write that book. I’m so sorry it’s taken me so long to get here to write my thoughts, Dina. Life has a way of granting me with stretches for writing and reading for days, sometimes weeks, and then all of a sudden I can’t find a spare 10 minutes no matter how hard I try. I’m sure you can relate. 🙂 But your words here. Oh my. I love this so. I see so much of myself in what you’ve written. You have an amazing ability to make your personal writing universal, much like another writer we both admire (ahem, Lindsey). This is something I’ve been conscious of, and striving for, in my own writing lately, but feel like I’m not quite hitting the mark. That calling yourself a writer dilemma? I think we all struggle with it to an extent. I know I go through times where I feel like a complete fraud. I think if we keep showing up, keep sitting down at the computer or notebook (or app, which I use too! ), if we just keep stringing those words together and toying with the pieces of these puzzles, if we keep studying the craft and drinking in the words of writers we admire, we can’t deny that we ARE writers. And that book you’ll never write? You must. It makes me happy to no end to know I could possibly read your words bound between hardcovers. In echoing all the other comments, please, please write it.